Playa del Carmen is located on a pristine stretch of coastline on the eastern Yucatan peninsular, known as the Riviera Maya. The Riviera Maya offers world class accommodation, unique natural wonders, beautiful beaches and historic treasures which make it a popular vacation destination for people from all over the world. We’ve compiled a list of the Top 10 Things To Do to assist you with you next visit. ‘Playa’ as it is known by the regulars, is a cosmopolitan town on the Caribbean Sea, securing a special place in the hearts of all who visit. Sparkling waters, fantastic restaurants, lively night life and friendly people are just some of the possible reasons why this town is the ‘jewel in the crown’ of the Riviera Maya. Natural, geologically formed pools filled with cool clear fresh water are scattered all along the Riviera Maya. Known for their refreshing, healing qualities, swimming in a cenote is an absolute must for visitors. Our favorites are Cenote Azul, Cristallino and Dos Ojos (Two eyes). The protected bay of Akumal is the feeding ground for a number of sea turtles. All year round, these majestic creatures feed on grasses growing from the sandy sea floor and don’t seem to mind inquisitive visitors watching them eat. Snorkel gear can be hired onsite. The ancient Mayan city of Coba makes a great day trip from Playa del Carmen. Take a guided tour and learn about ancient Mayan prophecies, hire bicycles to explore the vast grounds, then climb to the top of the main pyramid and imagine yourself as a powerful Mayan king surveying a great kingdom. The beaches of Tulum are famed for their underdeveloped shores and turquoise waters. Grab a good book, spread out a towel and soak up the laid back vibe.The Mayans who inhabited the city in ancient times certainly had good taste in real estate! The waters off the Riviera Maya are home to one of the world’s most spectacular reef systems. Most dive companies are located in Playa del Carmen or the nearby island of Cozumel, and can arrange a tour to suit you. South of Tulum, discover ‘Paradise on Earth’ at the Sian Ka’an Biosphere Reserve, a protected area of untold natural and ecological beauty. Take a boat ride through the lagoon to discover manatees, dolphins and unique bird life, then feast on fresh lobster at a water front restaurant in the tiny town of Punta Allen. 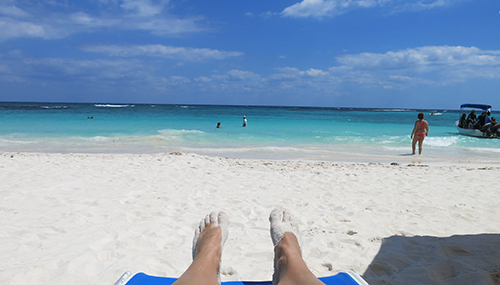 Discover the lesser known beaches of Xcacel and Xpu- ha south of Playa del Carmen, then decide which is your favorite. Is it the natural, rugged beauty of Xcacel, or the laid back beach bars and aquamarine waters of Xpu-ha? You decide. A sleepy fishing village just north of Playa del Carmen, Puerto Morelos retains a relaxed atmosphere whilst offering great restaurants and one of the best English book stores on the Mayan Riviera. Pick out a great book then read it over fresh ceviche or seafood tacos and forget about having a ‘To Do’ list at all. For more information on transport options and tours for the above activities, contact our concierge service.